Background: Chronic rhinosinusitis (CRS) is one of the most common illnesses interfering with patient's quality of life and work. Observational studies conducted by the Council indicate positive outcome. This protocol has been developed to ascertain the usefulness of homoeopathic intervention in comparison with control group in a randomised control setting. Objectives: Primary objective is to evaluate the changes in TSS (Total Symptoms Score) and SNOT-22 (Sino-nasal Outcome Test-22) within the two groups of the study (Homoeopathy + Placebo). Secondary objective is to evaluate changes in SNOT-22 at end of the trial, changes in Lund and Mackay staging of CT scan, rhinoscopy grading, absolute eosinophil count, global assessment by investigator and patient, and number of acute exacerbations of CRS (for frequency, duration and intensity) as per TSS scale compared to placebo. Methods/Design: This is a randomised double blind, placebo-controlled, multi-centric parallel arm trial of 6 months (three months treatment and three months observation period) with 14 days run-in period. The primary outcome is a composite of the changes in the TSS and SNOT-22 over 3 months from baseline with area under the curve and changes over 3 months in the Sinus Nasal Outcome Test 22 (SNOT-22) from baseline. Prescription shall be made as per the homoeopathic principles. Efficacy data will be analysed in the intention-to-treat population. Discussion: This trial will help to evaluate the efficacy of homoeopathic individualised treatment using LM-potencies versus placebo in patients suffering from CRS as per the homoeopathic dictum. Homoeopathic medicine (s) are reported to cause improvement in a range of chronic and recurring pathologies and especially respiratory disorders. , It has been observed that patients seeking homoeopathic treatment had a better overall outcome compared to patients on conventional treatment  . A study conducted by CCRH on sinusitis showed positive results  but it lacked proper investigations. Another study by Witt et al. not only showed improvement in symptoms related to CRS but also in quality of life. Further, the observational study by Nayak et al. not only showed improvement in symptoms but also showed negative x-ray findings. The above observational studies reflect positive effects of Homoeopathy. However, to evaluate the efficacy of individualised Homoeopathy, a randomised, double blind, placebo-controlled, multi-centric parallel arm trial is carried out. 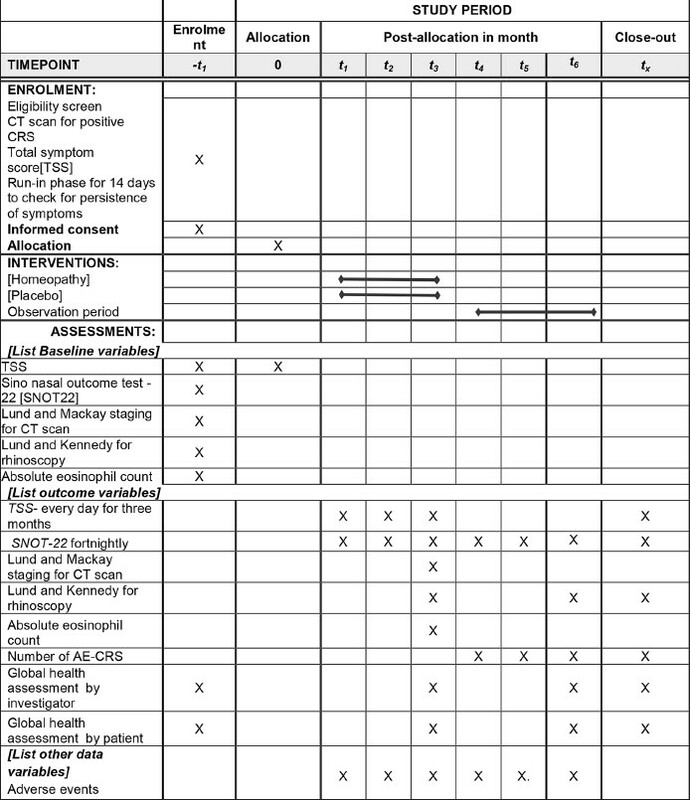 To evaluate changes in Total Symptoms Score (TSS) and Sino-Nasal Outcome Test -22 (SNOT-22). To evaluate changes in SNOT 22 at end of the trial, changes in Lund and Mackay staging of CT scan, rhinoscopy grading, absolute eosinophil count, global assessment by investigator and patient, and number of acute exacerbation of CRS (for frequency, duration and intensity) as per TSS scale compared to placebo. This multi-centric study shall be carried out at four centres of CCRH as a randomised, double blind, placebo controlled trial with three months treatment and three months observation. At each study centre, a consultant, an ENT specialist shall be engaged for grading the rhinoscopy, TSS and SNOT score, and to help the investigator as and when required. Patient's eligibility is confirmed by the study investigators according to the inclusion and exclusion criteria mentioned in [Table 1]. The study is a prospective, randomised, double-blind, placebo-controlled, multi-centric parallel arm trial. Both the investigators and participants will be blinded to the group allocation. The trained pharmacist shall dispense medicines to Homoeopathy or placebo group according to a randomised assignment sequence generated by http://www.randomizer.org/and with the code 1 or 2 chosen by the study's coordinator. The randomisation sequence (one set of 30 non-unique numbers, ranging from 1 to 2, unsorted) was recorded and sent to the pharmacist at the start of the study. Only the chief coordinator and the pharmacist had access to the code of the randomised sequence during the study. After each patient completes the 6-month trial (or in emergency interventions−clinical worsening, disturbing adverse effects, if any), the pharmacist will inform the coordinator about Homoeopathy group or placebo group without disclosing the code. Each patient shall be given individualised homoeopathic medicine/placebo. Following inclusion, the patients shall go through a homoeopathic anamnesis with the investigator at each centre followed by repertorisation of the case to arrive at a group of medicines. However, final selection of medicine is to be made in consultation with Materia Medica. Homoeopathic LM-potencies will be procured from Good Manufacturing Practices certified company ranging from LM 1 to LM 30. To begin with, all the prescription will start with LM1 and shall move to higher potencies. The pharmacist will be oriented about preparation and dispensing of medicine as per homoeopathic principles. After receiving the prescription of investigator, the medicine was prepared as follows: One globule (poppy-seed size) of the medicine in LM potency to be dissolved in 120 ml of distilled water containing 2.4 ml (2% v/v) of dispensing-alcohol premixed in it, followed by ten uniformly forceful downward strokes given against the bottom of the phial. This solution shall be given to the respective patient with the instructions regarding the dosage as per the advise of the the investigator. Patients randomised to this group shall receive placebo in similar manner to that of homoeopathic group; however, it would constitute unmedicated poppy-size sugar globule impregnated with dispensing alcohol, and any change triggered after administration (improvement/deterioration) will be followed by placebo only. Before enrolment, it shall be ensured that patient is not taking any medication for a period of 14 days prior to enrolment in the trial i.e. in the run-in-period which shall help to assess for predominance of symptoms. If a patient is having Adverse Event-Chronic Rhino Sinusitis during the trial period, a symptom reliever such as saline nasal spray can be used in both the groups as a rescue remedy according to the need of each case. The primary outcome is a composite of the changes in the TSS over 3 months with area under the curve and changes over 3 months in the Sino Nasal Outcome Test - 22 (SNOT-22) from baseline. Changes in global assessment by patient and physician at 3 months and 6 months. 6 months for enrolment + 3 months treatment + 3 months observation period + 6 months for data analysis and manuscript preparation. The flow diagram of time line is given in [Figure 1]. The sample size was calculated keeping in view the outcome of the earlier observational study on chronic sinusitis by the Council (October 2005-March 2010). The effect size in the previous study was found to be 0.8. Therefore, in this present study, using effect size of 0.8, with power 95%, α =0.05, intervention: Placebo: 1:1, the sample size calculated to be 42:42. Therefore, 84 samples were required. As the trial is multi-centric (4 centres) and for equal distribution among 4 centres, the sample size divisible by 4 was rounded up to 12:12 keeping the ratio intact. Further, with 15% of dropouts, the total sample size was rounded to 15:15 per centre. Thus, 120 patients shall be enrolled in the study. Data shall be collected at baseline from enrolled patients ],[ including demographics and past medical history, by the investigators at each centre. All information as mentioned will be recorded in pre-designed Case Record Form (CRF), original reports of investigations will also be documented. TSS and SNOT Forms will be filled by the patients. The consultant ENT will help in interpretation of the investigations and will be recorded in CRF. Any adverse event received will be noted and the coordinator will request additional details, specific to the nature of the event. The information of all patients screened and enrolled shall be recorded. The case history of each enrolled case is to be recorded in the CRF and the relevant annexure pertaining to baseline assessment, TSS, SNOT-22, CT scan, changes in endoscopic grading, changes in bio-marker (AEC), global assessment by the investigator and patient, AE-CRS reporting form and details of medicine dispensing shall be entered and maintained. Efficacy data will be analysed in the intention-to-treat population. Continuous variables will be summarised using number of observations, median (inter-quartile range) or mean (SD) depending on variable distributions, whereas categorical variables will be summarised by the number and percentage of events. For primary outcome measure, area under the curve at 3 months shall be considered for TSS. Repeated measures shall be undertaken for SNOT-22, t- test will be carried out for CT scan, rhinoscopy and AEC, and other statistical tools, as appropriate, shall be used. The trial is approved by the Ethics committee of Central Council for Research in Homoeopathy. This study is to be conducted according to standards of Good Clinical Practice of India and in accordance with the requirements of the Declaration of Helsinki. At the designing stage, endoscopic grading for CRS was recommended. However, due to feasibility problems and common consensus of consultants engaged in the trial, rhinoscopy was used for grading of sinusitis. The allocation of intervention, a priori it was designed to allocate in the ratio of Homoeopathy: Placebo=2:1. The effect size in the previous study was found to be 0.8. Therefore, in this present study, using effect size of 0.8, with power 95%, α =0.05, intervention: Placebo=2:1, the sample size calculated to be 63:31. Therefore, 94 samples will be required. As the trial is multi-centric (4 centres), for equal distribution among 4 centres, the sample size divisible by 4 rounded up to 70:35 keeping the ratio intact. Further, with 10% of drop outs the total sample size was rounded to 20:10 per centre. Therefore, 120 patients were required for enrolment but allocation was done in the ratio of 1:1. Several observational studies ,,,, and controlled trials with complex Homoeopathy ,,,,,,, have shown positive outcome in respiratory complaints. However, for the first time this trial evaluates the efficacy of individualised Homoeopathy in chronic rhinosinusitis. Standard guidelines such as CONSORT  guidelines for reporting randomised trials with parallel groups, the reporting data on homoeopathic treatments (RedHot)  supplement to CONSORT and SPIRIT  guidelines are followed. A long-term observational study conducted by Sharma et al. on sinusitis with 394 followed-up patients showed complete cure in 138 patients, with no relapse after a follow-up period of one year. Another study by Witt et al. included 134 adults showed relevant improvements persisting for 8 years in patients seeking homoeopathic treatment because of sinusitis. Further, in a short-term multi-centric observational study among 550 chronic sinusitis patients by Nayak et al. the patients showed symptom relief along with reversal of pathology through X-ray findings after homoeopathic treatment. In all the above-mentioned studies, homoeopathic medicines were found to have a positive role in treating a chronic condition such as sinusitis. However, control groups were either lacking or the control group was a complex Homoeopathy. In the present study, we attempted to incorporate these, so that a definite outcome can be observed. Chronic sinusitis is amenable to homoeopathic intervention; individualisation as per homoeopathic principles is applied, expert involvement throughout the study design reflects support of homoeopathic practitioners, validated questionnaire i.e. TSS and SNOT-22 would address the main outcome measure reflecting the key effects expected of the intervention and will help in detecting change. Further, earlier study results by Nayak et al. showed marked change in follow up of three months, which was considered for this design. The methodology adopted here is based on expert opinion and can be extended to day-to-day clinical practice by homoeopathic practitioners. Thus, it concurs with the Model Validity of Homoeopathic Treatment (MVHT) developed by Mathie et al. This methodology can be assessed for almost perfect concordance with the six judgmental domains enabled MVHT. We are optimistic that the trial has achievable enrolment targets and shall answer an important question in this emergent field. The data analysis is in progress and the result will be published soon. We thank Dr Preeti Arora, Senior Research Fellow for technical assistance. 1. Benninger MS, Ferguson BJ, Hadley JA, Hamilos DL, Jacobs M, Kennedy DW, et al. Adult chronic rhinosinusitis: Definitions, diagnosis, epidemiology, and pathophysiology. Otolaryngol Head Neck Surg 2003;129:S1-32. 2. Fokkens W, Lund V, Mullol J. 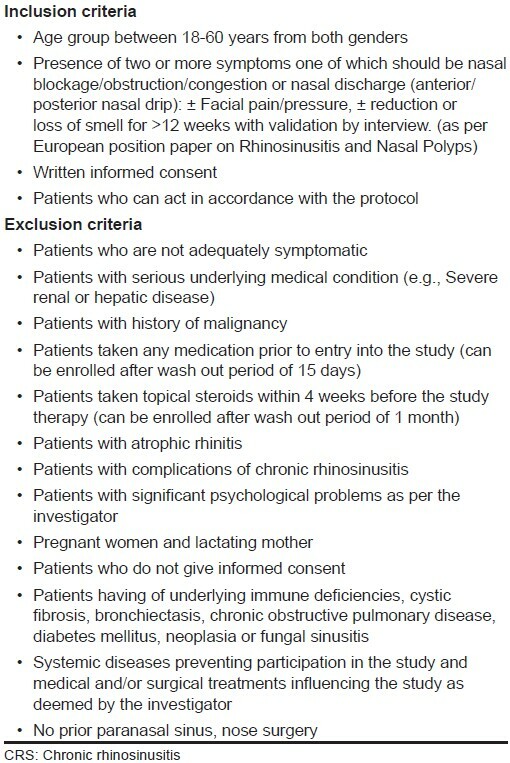 (on behalf of the EP3OS group): European Position Paper on Rhinosinusitis and Nasal Polyps 2007. Rhinology 2007:1-139. 3. McCaig LF, Hughs JM. Trends in antimicrobial drug prescribing among office based physicians in the United States. JAMA 1995;273:214-9. 4. Harvey R, Hannan SA, Badia L, Scadding G. Nasal saline irrigations for the symptoms of chronic rhinosinusitis. Cochrane Database Syst Rev 2007:CD006394. 5. Khalil HS, Nunez DA. Functional endoscopic sinus surgery for chronic rhinosinusitis. Cochrane Database Syst Rev 2006:CD004458. 6. File TM Jr, Hadley JA. Rational use of antibiotics to treat respiratory tract infections. Am J Manag Care 2002;8:713-27. 7. Chan Y, Kuhn FA. An update on the classifications, diagnosis, and treatment of rhinosinusitis. Curr Opin Otolaryngol Head Neck Surg 2009;17:204-8. 8. Rossi E, Endrizzi C, Panozzo MA, Bianchi A, Da Frè M. Homeopathy in the public health system: A seven-year observational study at Lucca Hospital (Italy). Homeopathy 2009;98:142-8. 9. Spence David S, Thompson EA, Barron SJ. Homoeopathic treatment for chronic disease: A 6-year, university-Hospital Outpatient observational study. J Altern Complement Med 2005;11:793-8. 10. Witt C, Keil T, Selim D, Roll S, Vance W, Wegscheider K, et al. Outcome and costs of homoeopathic and conventional treatment strategies: A comparative cohort study in patients with chronic disorders. Complement Ther Med 2005;13:79-86. 11. Sharma SR, Murty KB, Sahagal GC, Sharma B, Bharatalaxmi KS, Kolli, et al. Clinical evaluation of homoeopathic medicines in sinusitis. Ind J Res Homoeopathy 2008;2:26-37. 12. Witt CM, Ludtke R, Willich SN. Homoeopathic treatment of patients with chronic sinusitis: A prospective observational study with 8 years follow up. BMC Ear Nose Throat Disord 2009;9:7. 13. Nayak C, Singh V, Singh VP, Oberai P, Roja V, Shitsanshu SS, et al. Homoeopathy in chronic sinusitis: A multicentric observational. Homeopathy 2012;101:84-91. 14. Haidvogl M, Riley DS, Heger M, Brien S, Jong M, Fischer M, et al. Homeopathic and conventional treatment for acute respiratory and ear complaints: A comparative study on outcome in the primary care setting. BMC Complement Altern Med 2007;7:7. 15. Wiesenauer M, Gaus W, Bohnacker U, Haussler S. Efficiency of homoeopathic preparation combinations in sinusitis. Results of a randomized double blind study with general practitioners. Arzneimittelforschung 1989;39:620-5. 16. Adler M. Efficacy and safety of a fixed-combination homoeopathic therapy for sinusitis. Adv Ther 1999;16:103-11. 17. Suter A, Bommer S. Acute and chronic sinusitis: Treatment with a homoeopathic sinus spray. Results of a clinical study on the efficacy and tolerability of the homoeopathic "sinuforce spray". Schweiz Zschr Ganzheits Medizin 2003;15:233-8. 18. Zabolotnyi DI, Kneis KC, Richardson A, Rettenberger R, Heger M, Kaszkin-Bettag M, et al. Efficacy of a complex homoeopathic medication (Sinfrontal) in patients with acute maxillary sinusitis: A prospective, randomized, double-blind, placebo controlled, multicenter clinical trial. Explore (NY) 2007;3:98-109. 19. Weiser M, Clausen BP. Controlled double-blind study of a homoeopathic sinusitis medication. Biol Ther 1995;13:4-11. 20. Rainer G, Michael W. Antihomotoxic treatment of chronic sinusitis. Results of a drug monitoring study with Euphorbium compositum S Drops. Med Biol 2000;13:84-7. 21. Ammerschlager H, Klein P, Weiser M, Oberbaum M. Treatment of inflammatory diseases of the upper respiratory tract e comparison of a homoeopathic complex remedy with xylometazoline. Forsch Komplementarmed Klass Naturheilkd 2005;12:24-31. 22. Friese KH, Zabalotnyi DI. Homeopathy in acute rhinosinusitis: A double-blind, placebo controlled study shows the efficiency andtolerability of a homoeopathic combination remedy. HNO 2007;55:271-7. 23. Schulz KF, Altman DG, Moher D. CONSORT Group. CONSORT 2010 statement updated guidelines for reporting parallel group randomized trials. PLoS Med 2010;7:e1000251. 24. Dean ME, Coulter MK, Fisher P, Jobst KA, Walach H. Reporting data on homoeopathic treatments (RedHot): A supplement to CONSORT. J Altern Complement Med 2007;13:19-23. 25. Chan AW, Tetzlaff JM, Gôtzsche PC, Altman DG, Mann H, Berlin JA, et al. SPIRIT 2013 explanation and elaboration: Guidance for protocols of clinical trials. BMJ 2013;346:e7586. 26. Mathie RT, Roniger H, Van Wassenhoven M, Frye J, Jacobs J, Oberbaum M, et al. Method for appraising model validity of randomised controlled trials of homoeopathic treatment: Multi-rater concordance study. BMC Med Res Methodol 2012;12:49.